Be the first to share your favorite memory, photo or story of Jewel "Judy" . This memorial page is dedicated for family, friends and future generations to celebrate the life of their loved one. Jewel (Judy) Francis Keil , age 88, of Peoria, IL, passed away on Oct 8, 2018, at the OSF Richard L. Owens Hospice Center in Peoria. Judy was born on May 28, 1930, in Peoria. She was the daughter of Andrew J. Bradshaw and Nancy (Norman) Bradshaw. Judy graduated from Manual High school and attended Bradley University where she met her husband, Donald Keil. They were married in 1951. He survives. She is also survived by her son Gary (Michelle) Keil of Peoria and daughter Sally (Mike) McGraw of Santa Fe, NM, grandsons Shane (Dannie) Keil and Kyle McGraw, granddaughters Sarah Keil and Kara McGraw, and two great-grandchildren. She was preceded in death by her parents, three brothers, Melvin B., Phillip, and Rodger and two sisters, Nona and Velma. Judy devoted her life to caring for her husband, raising her children, and serving the Lord. She was a member of Grace Presbyterian Church in Peoria for 56 years, and was also active at churches in Brussels, Belgium, and Leicester, England, when she lived abroad. 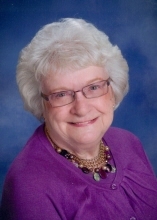 She also served as a Board Member for the Peoria Southside Mission for 15 years. She loved and cared for everyone, especially children, and wholeheartedly enjoyed teaching children at Grace Vacation Bible School during summer vacations. Services will be held Monday, October 15, 2018 at 11am at Grace Presbyterian Church in Peoria. Visitation will be held on one hour prior to the service at church as well as on Sunday, October 14, 2018 from 2pm to 5pm at The Wilton Mortuary in Peoria. Rev. John Hopwood will be officiating. Burial will be at Swan Lake Memory Gardens in Peoria. Memorials may be made to the Peoria Southside Mission or Grace Presbyterian Church. "Email Address" would like to share the life celebration of Jewel "Judy" F. Keil. Click on the "link" to go to share a favorite memory or leave a condolence message for the family.